Bone Marrow Aspirate Concentrate is increasingly shown to be a highly effective treatment in the Orthopedic care of the aging athlete. My experience since I started my Regenerative Medicine initiative when combined with the outcomes at Regenexx demonstrate that Stem Cell therapies will reduce pain and improve function among patients with Osteoarthritis and Avascular Necrosis. In stage 2 or 3 arthritis, the total joint replacement may be avoided; in stage 4 arthritis, the total joint may be postponed. It is becoming increasingly evident that the success of the Stem Cell therapies are based on a number of factors related to the patient (age, activity level, weight, use of tobacco and other medications and co-morbidities); the physician (training, technique and volume of procedures performed); the setting (implementation of standardized clinical care pathways, availability of dedicated staff, and volume of procedures performed); and the technology for stem cell procurement concentration, and quantization of the injectate. A Stem Cell intervention should reduce the long term need for a total joint replacement or entirely eliminate that possibility. Historically, much emphasis has been placed on overcoming opposition to the concept of using ones own cells for elective treatment of arthritis. Much effort is now directed to evolution of better technologies. Regenexx has gone so far as to standardize methodologies in its affiliated network based on continuing research. As a result of that research, for those over 65, an alternative means of delivering stem cells and platelet rich plasma was introduced in 2012 and is proving remarkably successful in the short run. The U.S health-care system is going through a period of unprecedented change and faces many challenges in the years ahead. Total joint replacements constitute the highest single procedural expense in the Medicare budget. A recent article in the Journal of Bone and Joint Surgery reviews strategies to improve patient outcomes after a total joint replacement and concludes that enhancements of implant longevity should be deemphasized. Because the end result of a failed joint replacement is a revision surgery with a less than satisfactory functional outcome, doesn’t it make sense for a patient to understand stem cell therapy of arthritis? 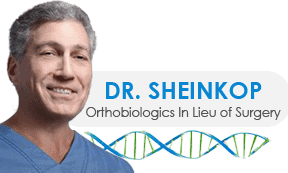 In my Blog, I have emphasized the fact that as an orthopedic surgeon, I performed hip and knee replacements for 38 years. I look back at 2012 as my having found a way to offer my patient a joint replacement alternative. I begin 2013 with several clinical research initiatives, which I hope will extend the duration of a stem cell treatment for arthritis and improve the functional outcome.